Synopsis (from the book jacket): What a fine story this is! A boy who can talk to animals. full of bravery and daring. donkeys, and a bag of bones. Why I recommend it: The voice is superb. Boy himself tells the tale in first person. Masterful writing, a compelling plot, and intriguing characters (especially Boy and Secundus, a mysterious pilgrim who hires hunchbacked Boy to carry his pack on a pilgrimage) make this a novel you MUST read. Plus, the research is most impressive and the book jacket and chapter headings are beautifully designed. I was still hospitalized when this book came out in February, so I completely missed it, but thankfully, the publisher recently sent me a copy, in exchange for an honest review. Set in 1350 Europe, this is a compelling, funny, earthy and yet religious tale, reminiscent of Chaucer, though with a touch of magical realism. I had no trouble divining the mystery of who Boy really is, but I'm sure an 8 or 9 year old would be kept guessing. Have you read The Book of Boy? What did you think? In Your Shoes by Donna Gephart (October 9, 2018, Delacorte Press, 336 pages, for ages 8 to 12). Miles is an anxious boy who loves his family's bowling center. Then Miles and Amy meet in the most unexpected way... and it is the beginning of everything. Why I recommend it: The publisher's synopsis doesn't tell you much, but this is one of those sort-of-sad-but-not-too-sad books about a dead mother, specifically Amy's. However, Miles is dealing with his own grief, having recently lost his beloved grandmother. But the way they meet is more like slapstick humor (his bowling shoe, tossed in the air, meets her forehead) and there's a lot of realistic middle-school awkwardness along the way. I'd almost tag this Upper MG because one of the major plot points involves a school dance and the ensuing drama. The characters are delightfully real, the dialogue is spot-on, and the setting is small-town Pennsylvania (woo hoo!). There's a wonderful, caring librarian named Mr. Schu (which, no doubt, some of you will understand, besides the obvious homonym). The only thing I could have done without is the nosy narrator intruding every once in a while. Just let me lose myself in the story! Don't keep reminding me it's a story. It's not a big deal, though, because Donna Gephart has mastered this dual POV novel (in third person), and she's not afraid to delve into difficult questions of life and death, of shyness, and of overcoming odds, both physical and emotional. In lesser hands it would have fallen apart. Favorite lines: (from p. 37) Get up, sweets. You're not going to let a little thing like an airborne bowling shoe hold you back. Are you? Amy shook her head in answer. She loved when her mom's voice floated into her head. It seemed to come when she needed it most, and it made her feel less alone, more brave. You've probably had this happen to you. You're slogging away at revisions on your last manuscript (in my case, written in 2016 and revised a few times in 2017 before I was laid low by illness). And you're trying to make it better, stronger, more compelling, when you're struck by... THE SHINY NEW IDEA! Yep. That's what happened to me. I quickly started a new notebook for ideas and scribbled down everything that occurred to me. It filled, oh, about three pages. And waited... Days went by. Then weeks. And nothing else occurred to me. Having a shunt in my head makes me feel like all the creativity is being sucked out of my brain. When a Shiny New Idea fizzles, what do YOU do? THE THIRD MUSHROOM by Jennifer L. Holm (on sale September 4, 2018), Random House, 240 pages, for ages 8 to 12. Includes 17 pages of back matter, like the author's note about the discovery of penicillin, a list of recommended reading, and a gallery of scientists, which is fun because it reads as if Ellie wrote it. Synopsis (from the publisher): Ellie’s grandpa Melvin is a world-renowned scientist . . . in the body of a fourteen-year-old boy. His feet stink, and he eats everything in the refrigerator–and Ellie is so happy to have him around. Grandpa may not exactly fit in at middle school, but he certainly keeps things interesting. When he and Ellie team up for the county science fair, no one realizes just how groundbreaking their experiment will be. The formula for eternal youth may be within their reach! And when Ellie’s cat, Jonas Salk, gets sick, the stakes become even higher. But is the key to eternal life really the key to happiness? Sometimes even the most careful experiments yield unexpected–and wonderful–results. Why I recommend it: This breezy and hilarious sequel to THE FOURTEENTH GOLDFISH is almost better than the first book. It's funny, of course, but there's more to it this time, with even a slyly age-appropriate hint of romance, er, two romances (I won't spoil anything for you, but they may not be what you expect!). And, besides, it's just plain fun. I read the review copy in one day and then had a whopping headache. But it was so worth it. (And don't worry! The headache went away by the time I went to bed.) Sometimes you just need a book like this. The characters are perfect, the dialogue spot-on, and the premise fascinating. Put it all together and you have a rollicking MG novel which is a sheer delight to read. Favorite line: (from p. 5) Middle school is like jail: the food is terrible, you're forced to exercise, and it's the same boring routine every day. Synopsis (from the book jacket): When Briana’s father dies, she imagines she has a new heart growing inside her. It speaks to her in her Dad’s voice. Some of its commands are mysterious. How can Briana “be her own” when her grieving mother needs her to take care of her demanding little brother all the time? When all her grandpa can do is tell stories instead of being the “rock" she needs? When her not-so-normal home life leaves no time to pursue her dream of writing for the school literary magazine? When the first blush of a new romance threatens to be nipped in the bud? Forced by the loss of her favorite parent to see all that was once familiar with new eyes, Briana draws on her own imagination, originality, and tender loving heart to discover a surprising path through the storm. Why I recommend it: The writing is superb. It gives this book a luminous and lovely quality, one you can't tear yourself away from. Briana is so compelling a character, you feel every bit of her grief, working through all the stages with her. She could easily be a real 13-year-old. Perhaps one you know. The northern Manhattan neighborhood of Inwood becomes a vibrant character in this book. Although I lived in Manhattan for two years, I never went to Inwood. But the author brings it fully to life here, making me wish I'd seen it for myself. p. 23 When he was tired or upset he always drooped like that, as if his skull were heavier on that side. It made him look like a dandelion someone had stepped on but not quite crushed. p.44 Mom shows me how to paint and glue paper wings on the clothespins. We work with our heads close together. Mom's curly hair brushes my cheek. Clamped down tight with little handmade guardian angels, our clothes dance on the line, casting long shadows. p, 66 I settled in next to him, fitting comfortably into the shape his shadow made as he leaned against the wall. It was good to have a friend big enough to make shade. Visit Laura Geringer Bass's author page. But now Cora is a middle schooler, a big sister, and homeless. Her mother is trying to hold the family together after her father's death, and Cora must look after her sister, Adare, who's just... different, their mother insists. Quick to smile, Adare hates wearing shoes, rarely speaks, and appears untroubled by the question Cora can't help but ask: How will she find a place to call home? 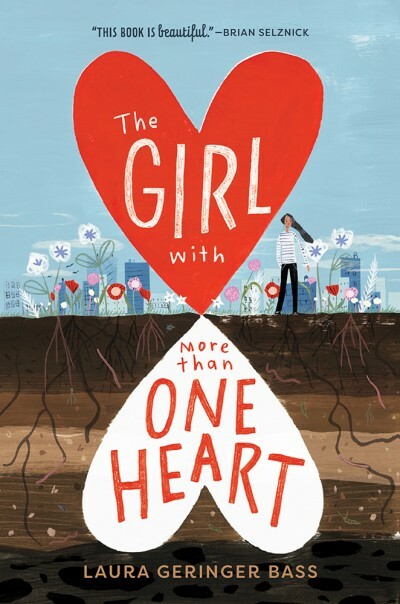 I love finding a new MG author and a new book that touches me deeply while also appealing to readers who are looking for "issue books". This one is so much more than an issue book. It's bursting with character, voice, and a gorgeous sense of place. Even if you've never been to Brooklyn, you'll feel you've known it forever. Mostly, though, it's Cora who will grab your heart from the first page. 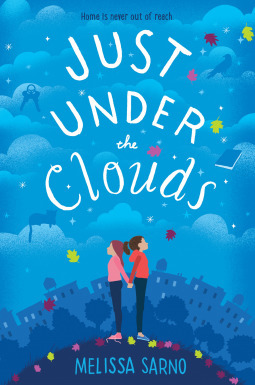 Imagine how thrilled I was to receive a review copy from Knopf of JUST UNDER THE CLOUDS. I've been following Melissa for many years on social media and I could tell by her posts that she's a wonderful writer. Now you can find out for yourself by buying and reading this lovely book. The story line is captivating. The characters feel ultra-real, the metaphors and similes are gorgeous. I can't wait to see what Melissa comes up with next. From p. 3: Adare was born special, Mom always says. She tells the story like it's a legend. She talks about the wind that night, in its quickening swirl... She talks about the moment Adare came into the world without a sound ---Not blue, no, more like lavendar, like sunset--and in that moment all the oxygen gone from the world, the trees forgetting to breathe their gift, Adare forgetting, too. From p. 86: Meredith Crane parades past, her friends cascading behind her like a frilly gown draping the floor. "I would really rather feel bad in Maine than feel good anywhere else." I'm going off topic here. Anyone who knows me or has followed this blog for a while knows that I survived a ruptured brain aneurysm in 2005. I always felt lucky, not just because I survived something most people don't but because it was the only aneurysm in my brain. 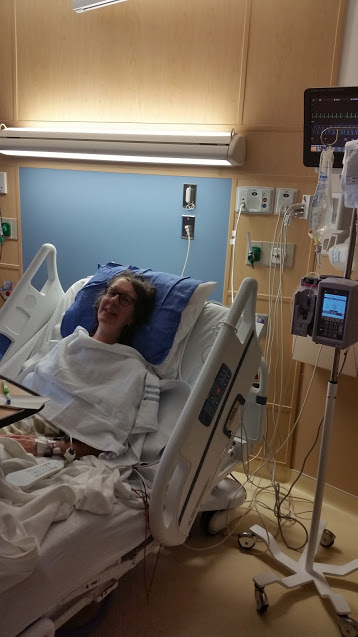 On September 29, 2017, my husband and I were enjoying the first full day of another vacation in Maine (we wanted to see the fall foliage) and at dinner I said to him, "I think you better take me to the hospital". Not that I have any memory of this. Nor do I remember that next eight weeks. Doctors at Maine Medical Center found two more aneurysms on the basilar artery (the same artery as my 2005 rupture) and one had ruptured. They coiled it and later also installed a shunt, to drain the excess blood in my brain. It was a long recuperation (in fact, I'm still recuperating, even though I'm home now). After a month in the hospital, I went to a rehab center in Maine. And after six weeks there, they allowed us to come home to Pennsylvania and transfer to a different rehab center. This second rehab center is the only part I remember. I don't know if those lost memories will ever come back to me, but in a way I'm not sorry. Who wants to remember being in pain, having your head cut open, and being hooked up to multiple machines? I know that I'm extremely lucky -- to have survived a rupture not once but twice in twelve years. 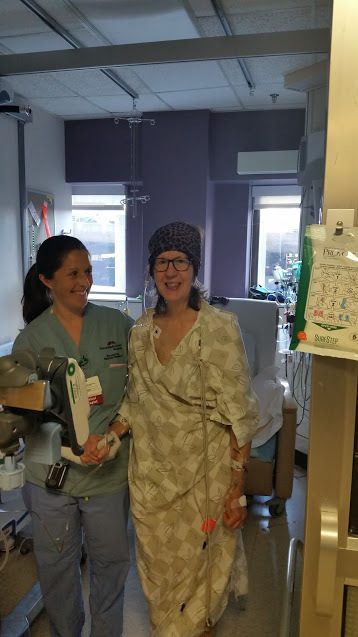 I also had wonderful nurses and doctors and a supportive husband who visited me every day (my kids came when they could). So my purpose today is to not only raise awareness of brain aneurysms but to let you know the blog is going to change. I will no longer be reviewing children's books on a regular basis. I'll still talk about an occasional superior book (how could I resist?) but I also want to share photos and thoughts on other topics. So it'll be "my brain on" other topics, not just books. Bear with me as the blog reinvents itself. And for more information on aneurysms, visit the Brain Aneurysm Foundation's website.